During the treatment, one or more needles are placed at or near the problem area. The technique uses a sterile acupuncture needle that is inserted through the skin into muscles, tendons, ligaments, and/or close to nerves to immediately reduce pain, decrease muscle tension and increase mobility. Successful treatments promote healing, decrease pain, increase flexibility, and improve muscle function. Dry Needling is not acupuncture; it is based on a modern scientific study of musculoskeletal and neuromuscular systems. There are many similarities and differences between dry needling and acupuncture, however. Licensed physical therapists in a growing number of states can use dry needling under the scope of their practice. In contrast to most schools of acupuncture, dry needling is strictly based on Western medicine principles and research. Dry Needling can be used for a variety of musculoskeletal problems. When combined with traditional physical therapy and the advanced manual therapy techniques, we have had success treating most pain related problems from head to toe and from acute to chronic conditions. In addition, dry needling can be used to help athletes overcome delayed onset muscle soreness. As athletes push the envelope to become bigger and faster or to reach new goals, recovery becomes an essential phase in the process. Often times dry needling can be used to speed up this recovery time and allow the athlete to return to training or to playing as soon as possible. For most people, there is little to no discomfort with the insertion of the needle. 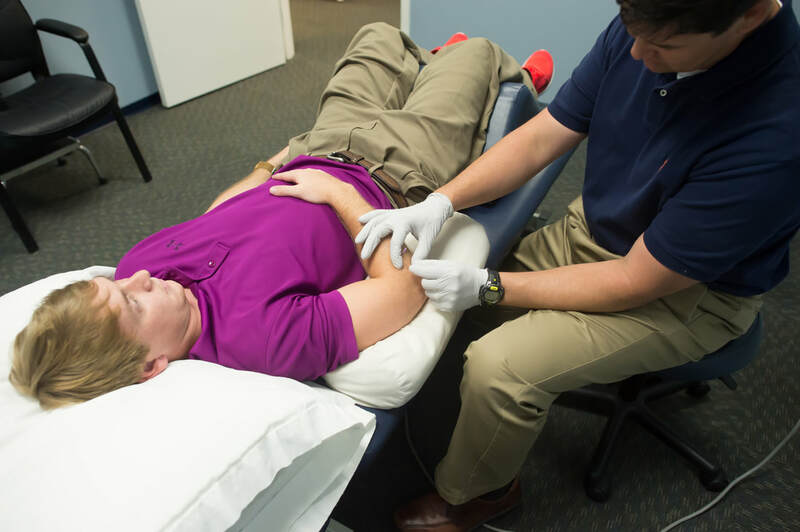 We strive to make the treatment virtually painless, however, at times, you may experience a “twitch response” which often feels like a quick muscle cramp or ache. These sensations are normal and even desirable at times. Following this technique, muscle soreness can be felt up to 24-48 hours. The application of heat or ice and drinking plenty of fluids usually reduces the soreness. Dry Needling is a powerful treatment technique that, when used in conjunction with our other treatments, can help you relieve your pain and improve your function quickly. Call us today to learn more about our dry needling therapy! Read more about dry needling and a testimony on our blog here. If you struggle with painful and tender muscles, you could benefit from this treatment. ​Call us for more information or to set up an evaluation.